* Heteroskedasticity is a term most frequently used in economics to refer to errors which have variances that vary in some functional way with observable characteristics. 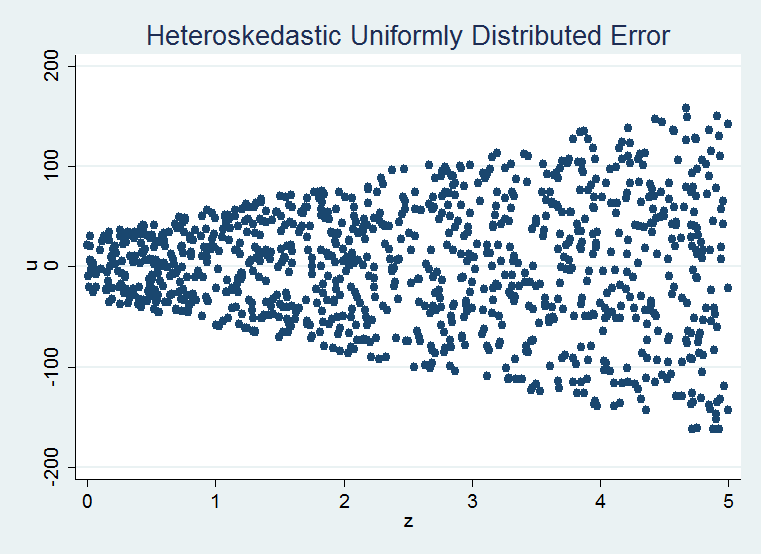 Heteroskedasticity does not cause bias but it does cause inefficiency (relative to an estimator that controls for heteroskedasticity - if one exists). What does this mean? Imagine that you are attempting to model the price of home sales as a function of observable data such as # of rooms, # of bathrooms, yard size, etc. But there is still a great deal of variation in your outcomes. You also know a little about the purchasers. Such as annual income and total assets. So you want to include this information in your analysis. You may not think that the income of purchasers does not directly influences the sale price of the home but instead influences the willingness of the purchaser to negotiate (the error is heteroskedastic in purchaser income). Thus one may argue that the variability of home prices might be a function of purchaser income. * Let's generate a sample data set that has heteroskedasticity in z. * Let's imagine that we would like to estimate the effect of x on y. * This effect is small and not statistically significant. We would like to control for some of heterogeneity in order to get a better estimate. * We suspect the heterogeneity in the error might be related to z. * This is a classic form of heteroskedasticity. * There are some two step procedures that can be done to control for this form of heteroskedasticity, such as inverse variance weighting. * However, these methods have been shown to produce bias (when the result of two step procedures and are in general less efficient. * The better method is to estimate the heteroskedasticity simultaneously with the coefficient on x using Maximum Likelihoods. * I will write a small program to do this. * Following William Gould, Jeffrey Pitblado, and Brian Poi's book on maximum likelihood in Stata an estimation that allows for explicit modelling of the variance can be defined as follows. * The first argument of any maximum likelihood program is the name of the temporary log likelihood variable created by the stata when the ml procedure is called. * Each additional argument is an linear "equation" that Stata maximizes by choosing estimators for. * Thus we have two equations that we are asking Stata to solve. * The following is the log likelihood value that we would like Stata to maximize. * In this case, it is the log of the normal density asking Stata to choose the optimal mean and standard deviation. * This model is nearly identical to OLS except that is going to be slight variation due to the maximization program finding slightly different peaks. * By specifying /sigma we are in effect telling stata that we know there is a second equation, that we want only a constant estimated for it and we would like to call it sigma. * What is more appealing to us and the reason we wrote the ML program is that now we can easily specify a structural form for sigma. * Our estimates on the coefficient on x have improved dramatically. This is somewhat of a fluke of the draw however. With a different seed, I found the estimates did not improve uniformly. On average though, we should expect the correctly specified functional form to outperform the OLS model (in terms of efficiency). * Why is that? Without structurally modelling the errors, MLE or OLS are in effect giving equal weight to the size of the error no matter where in the distribution of z the error is occurring. Thus a residual that is a 10 when z is equal to 0 is regarded as equally significant as an error which is 10 when z is 5. 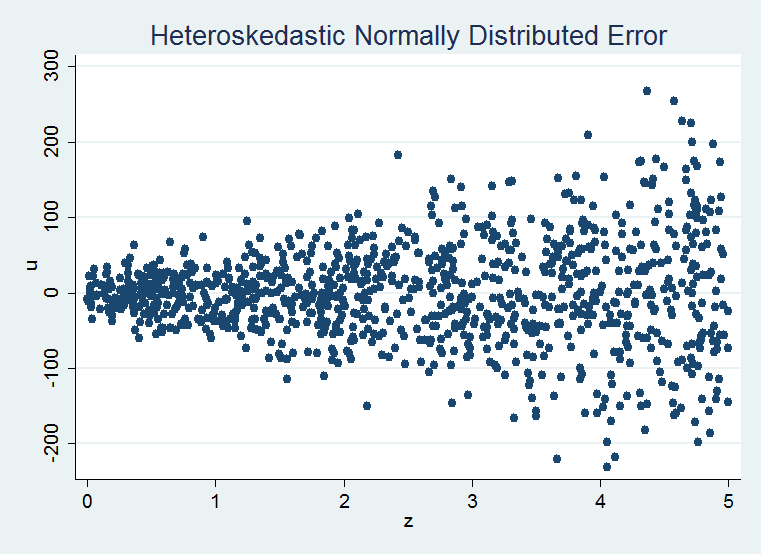 However, when looking at the distributions of residuals we can see that an error of 10 when z=0 is much larger proportional to the population of errors than that when z is large. The MLE form correctly (because we specified the data generating process) puts the correct weights on different errors with an error of 10 when z is equal to zero seen as much less likely than when z is equal to 5. * Now for a slight tangent. The following estimator does not work for me. * The only difference is that I generate the residuals and put those directly into the normal density function. * By the definition listed in the help file this form and the previous one are identical. * So what is the problem? I think it is a result of sigma being the denominator. * Perhaps it is harder to maximize this problem than the previous, but if so I do not understand why. * See comment below for the correction posted by Brian Poi (one of the coauthors of the aformentioned book). * A final note, simply because the Maximum Likelihood procedure assumes normally distributed errors does not mean that the above program will not provide good estimates when the error is not distributed normally. 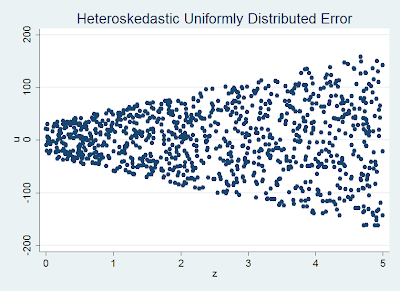 * The uniformaty of the error is obvious in the plot as a result of the clearly identifiable edges that characterize the uniform distribution. * We can see that though the error is not normally distributed and though myNormalReg assumes normality. 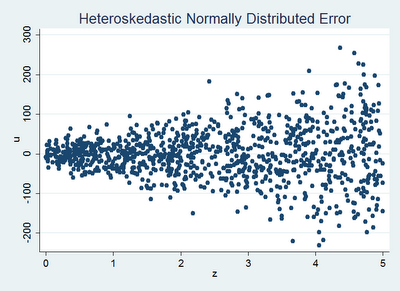 Overall it is working pretty well, though not as well as when the error is actually normally distributed. Thanks Brian, that is helpful. * Rather than using the built in pdf function, we can specify it directly. In the calculation of the variance/standard deviation of the uniformly distributed variable, the variance is ((b-a)^2)/12 , and so the s.d. is (b-a)/(sqrt(12)), not (b-a)/12. Please be specific about what you are attempting to correct. I believe the variance listed above is exactly what you say it is. For the sd 12^.5 is the same as sqrt(12). Is there some other part of the code that you found an error in?